First, I would like to apologize, that I did not posted regularly last times, as I maybe should. The reason is clear and simple – before start of the season and up-coming WC's I have been focused and busy with training and later, the competition schedule was quite hard and intensive. So, I have decided to wait until the month and sum it up all together. Well, it is maybe a bit harder task, because many things happened. Maybe for the beginning, I would start with feeling and motivation, which drive me on those 4-weeks package of WC's. I believed, that I have trained well and am good preapared, but was also awarded, that there are still weak points and/or moments of my climbing. And sure, that rest of the world probably did not sleep either :). But, I was very excited, to go on the first comp and see what happens. I have started this one with good feeling and after first round also get some 'confirmation' that my feeling was right and I am well prepared. I have continued to semifinals with provisional 3rd rank. Ok, I know that rank after qualifications doesn't mean nothing and it is important what you get out at the end. Well, next day thing swent pretty different and after falling from some almost finished boulders and missed out double dyno, I took 18th place. Definitely not satisfying and also disappointed about climbing and not finished boulders. 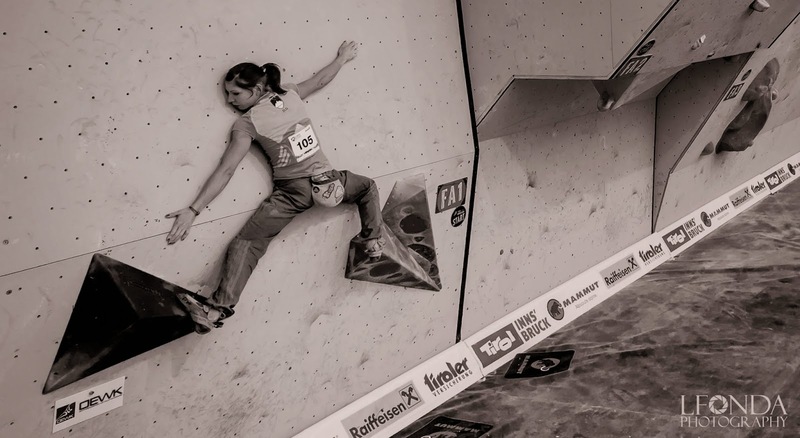 When I think back, I realize, that I wanted to have moves too much under control and in opposite of that, I finished on mats instead on top(s)... Well, I know it is hard, but with climbing like this I saw the future won't be as I would prefer. But ok, I said to myself, that I still have a chance to change things and put them on place when they should be. Next week! After some travelling complications we arrived at Baku. Interesting city and interesting place. I like the vibe when it comes to different places and cultures. The competition was placed near the sea and weather was not so friendly. From qualifications I remember just one thing – that it almost blow me out from the wall – luckily that there were some holds to garb hard to keep myself on the wall :). 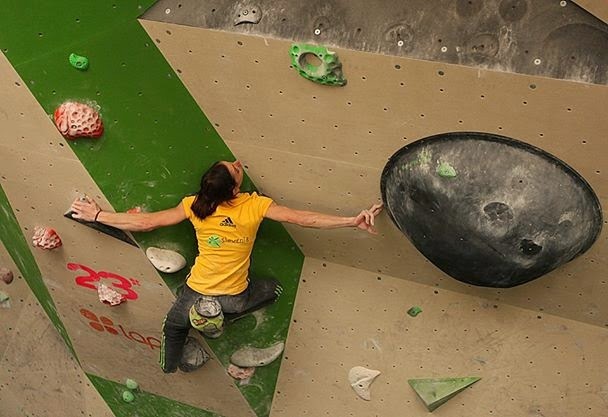 Next day, I went into the semifinal with much less confidence as I would prefer.Semifinal boulders were interesting and felt kind of different than on last comp. I managed to finish 2 of them and was also very close to the third top. It turned out that boulders were set quite hard and it was enough for final! After little doubts that performance in China has still left to me, I get back confidence and were excited to climb next round. Boulders in final looked hard, but at the end it turned out that they just looked alike. I know, I could finish them all. Yes, If I would attend them with just a little less 'respect'. But, at the end, I was happy with 5th place and not so good, but even not so bad climbing. Very excited to go back home and crush the next comp in Swiss's Grindenwald! On this comp, Slovenian team was little bigger and it was really nice to have a company of young and strong team-mates. Also concurrence on this comp was much wider than in China and Azerbaijan and there was already a big elimination in qualifications. Honestly, I did not put any attention to it before comp, just wanted to climb as I know and finish all boulders (if possible quite soon:). It worked quite well, and also next day I started the semifinals with this feeling. But, unfortunately messed out a bit in following boulders and just missed the final for one place and finished as 7th. Not really happy, but said to myself – ok, if I am well prepared and strong, there are still the chance next week, right? Well, there was no chance for me on this one :(. Ok, it was, but I didn't use it. I have no excuses for my worst climbing and comp result since I have started bouldering. I finished 2 boulders and left out of semifinals. Honestly, I don't remember when/if this had happened before. I still don't know exactly why, how and so on it happened - maybe it is 'just bouldering', maybe I was tired, or maybe all the things (including shoulder pain :S) came up together at wrong moment. Because honestly, I can not believe, that it was result of my preparation. One week you just can't be one of the strongest on the world and next one stay far from top 20 semifinal quote. It just can't be. Well, this month was definitely a month of big up-and-down swings for me. For my believe, confidence and also results like. But looking backward, I can say and sum up, that with my physical preparation looks like everything is very well based, but climbing sometimes unfortunately just don't reflect it. Dont worry Mina, You climb very well. Boulder is weird. It depends the kind of the boulders. If there are crimps, you are the stongest. I hope, you will win the next boulder WCs. You will always stay the most beautiful climbers of the WC. Good luck and keep on training!